The 2016 Wirksworth Festival, Derbyshire, UK, begins on Saturday 10th. September with the pioneering and now widely-famed Art and Architecture Trail which takes you from surprise to surprise, in and out of gardens, up and down the ancient hillside town temporarily or permanently colonised by artists from all over the town and from far and near. 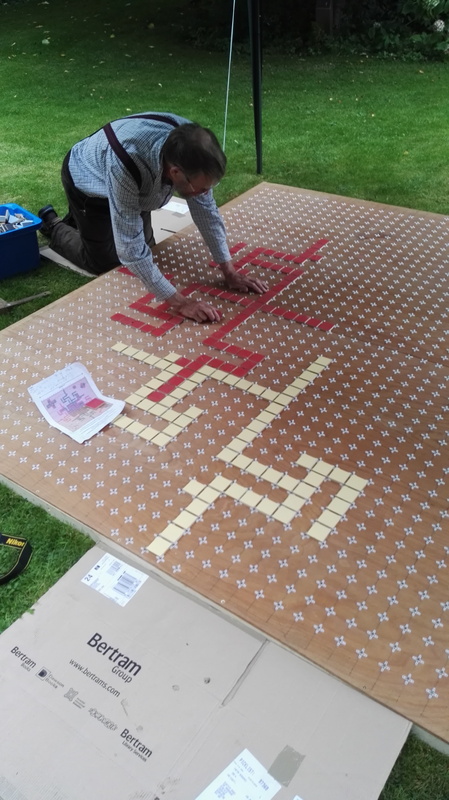 This year the trail includes a half-foot-sized tiled realisation of a version of Chinese Lattice Labyrinth (9,8), chosen to celebrate the patronal (or matronal?) festival of St Mary the Virgin, patron of Wirksworth’s mediaeval St Mary’s Church, which fell as recently as yesterday, as I write, September 8th. 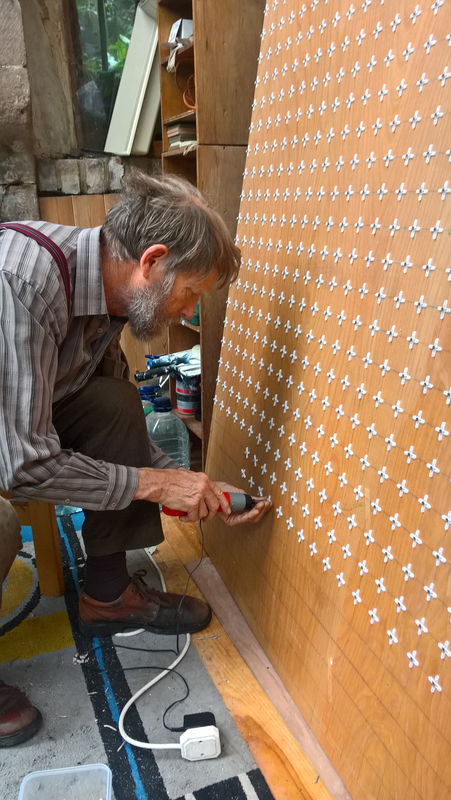 Four supertiles of this tessellation have a wingspan of 44 squares, which, if sized two-by-two-inches, can just be fitted onto two 8 foot by 4 foot (approx 2.4 metres by 1.2 metres) plywood boards. Here’s the design, with added doodles, submitted for the approval of the Trail curators. and in a rare moment of self-revelation here I am screwing tile-separators to one of the boards at 54 mm intervals (+ or – 1mm, I hope, or the 47mm x 47mm tiles won’t fit). 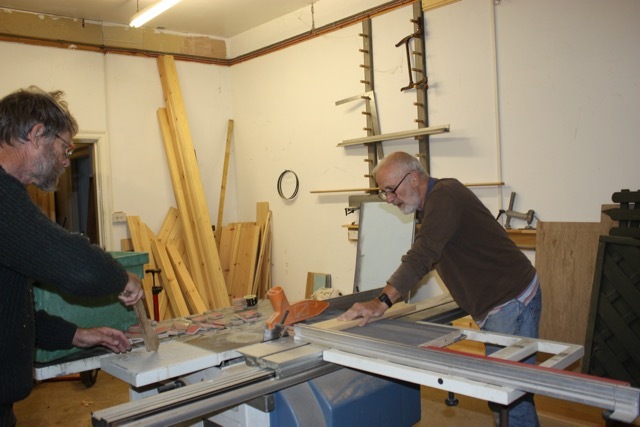 and here is the highly-skilled, self-moulded philosopher Jacob the Joiner (Jacob Butler), cutting up 1500 or so tiles on his rock-solid and millimetre-precise bench/table saw. 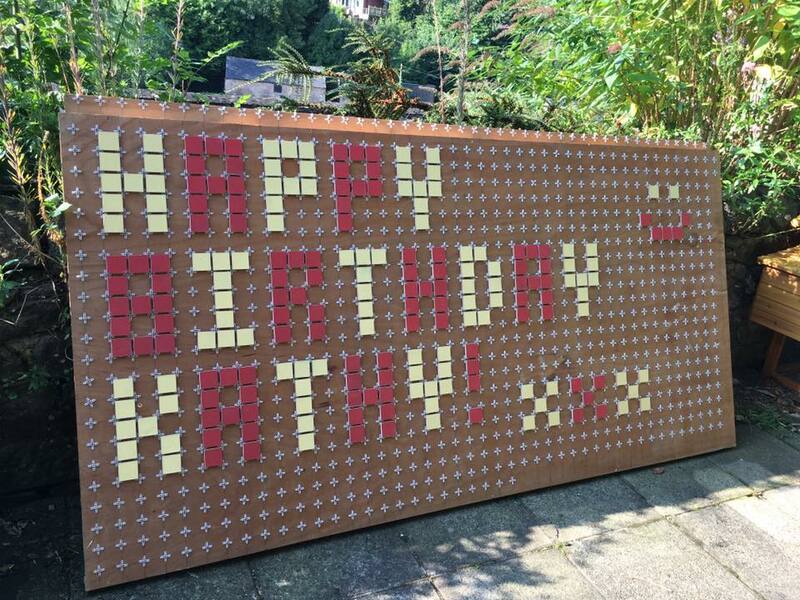 It took only about three hours. The tiles are medium density fibreboard which when sawn splinters much less than real wood. Other curiosities of the installation can be demonstrated if you dip into the Trail (completing it might take the two days) after purchasing a guide and badge at one of several accessible locations in the centre of Wirksworth. On a damp evening, Friday 9th. September, the completed piece was assembled by myself and son Michael, laid out flat on the lawn behind the Memorial Hall on St.John’s Street, necessarily sheltered by a substantial but obligingly pop-up gazebo. 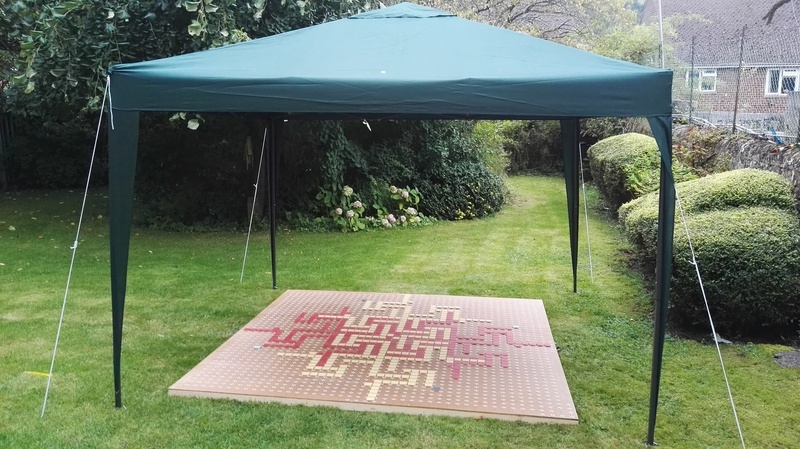 The whole concept has worked but I’m a bit disappointed by its appearance; tomorrow we’ll perhaps add some parts of some further supertiles in pale blue (against the red) and charcoal grey (against the yellow) to achieve more contrast with the board. PS now we’ve made this beast, its parts can be reassembled anywhere and to designs tailored to other dates or significant numbers. All rush at once. The Lattice Labyrinths workbook is available from the publisher or you-know-who , or from a good independent bookshop , via Google or for two days only on the lawn behind the Memorial Hall in Wirksworth, where two striking giftwrap designs, “Logistical Nightmare” and “Diamonds are Forever” (oops – a copyright infringement, I take back that title), are also to be had at £1.50 a sheet, 10% to the Festival. This entry was posted in Architectural Realisations, Birthday labyrinths, Chinese Labyrinths, National Labyrinths and tagged Derbyshire Dales, Lattice, matronal festival, Memorial Hall, patronal festival, St. Mary's Church, Tarquin, Tesslab, Wirksworth, Wirksworth Festival, Wirksworth St Mary. Bookmark the permalink. Wow! That was a lot of work, but well worth it. 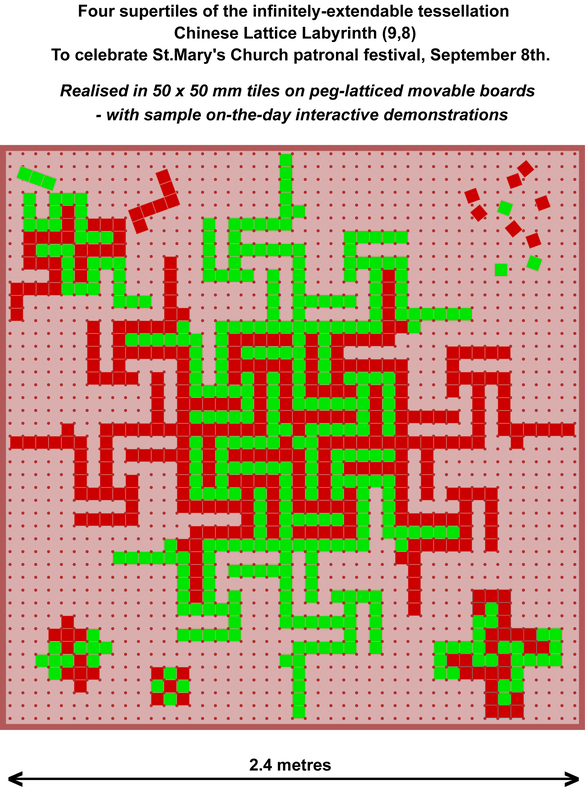 Now more people will be able to enjoy your tessellations! Aberdeen, Antwerp, Auckland, Bangkok, Bath, Baton Rouge, Berlin, Birmingham, Bombay, Brighton, Brisbane, Brunei, Cambridge, Canterbury, Cardiff, Cheltenham, Chicago, Delhi, East Dorset, Edinburgh, Ghent, Guelph, Guildford, Kolkata, Lagos, Leeds, Leicester, Lincoln, Lisbon, London, Lund, Manchester, Newcastle, Norwich, Nottingham, Oshawa, Oslo, Oxford, Peterborough, Phoenix, Portsmouth, San Antonio, Sheffield, Stockholm, Swansea, Sydney, Tacoma, Winnipeg and York. I shall attend the meeting in a Nottingham pub. Is there one within reach of you?